I’ve finally succumbed and bought myself a baker boy hat for winter. It took me ages to choose one, and even longer to decide whether or not to keep it…! 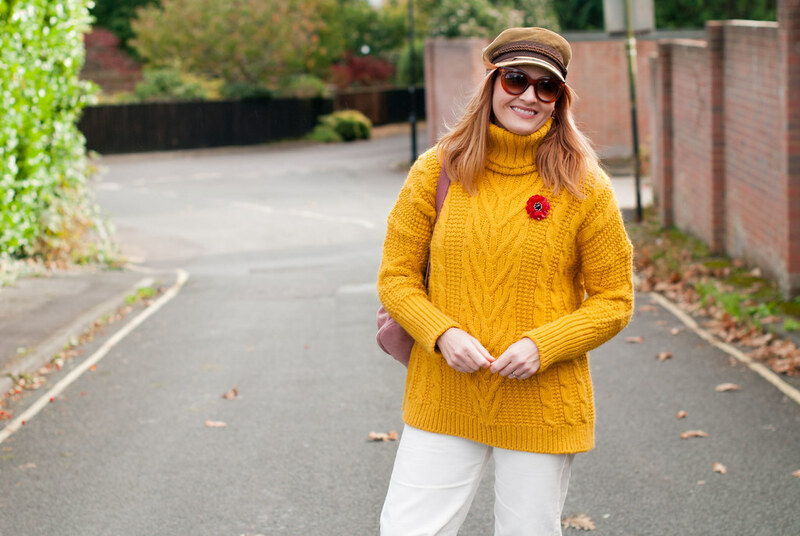 The baker boy hat is the trend that I accidentally left off my 3 must-have autumn/winter pieces post last month (velvet, Prince of Wales check blazers and white boots all appeared) but I forgot baker boy hats for some reason. 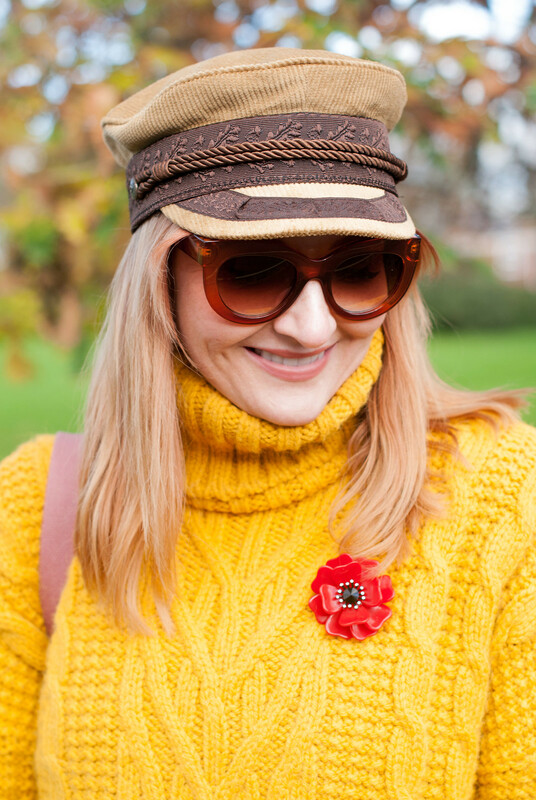 I couldn’t work out whether I really, really liked – or really disliked – this corduroy baker boy hat from Asos. The other choices were mostly black or dark colours, and you know me and my dislike of black… So shades of brown and camel it was! Trust me to choose the priciest one on the Asos website. 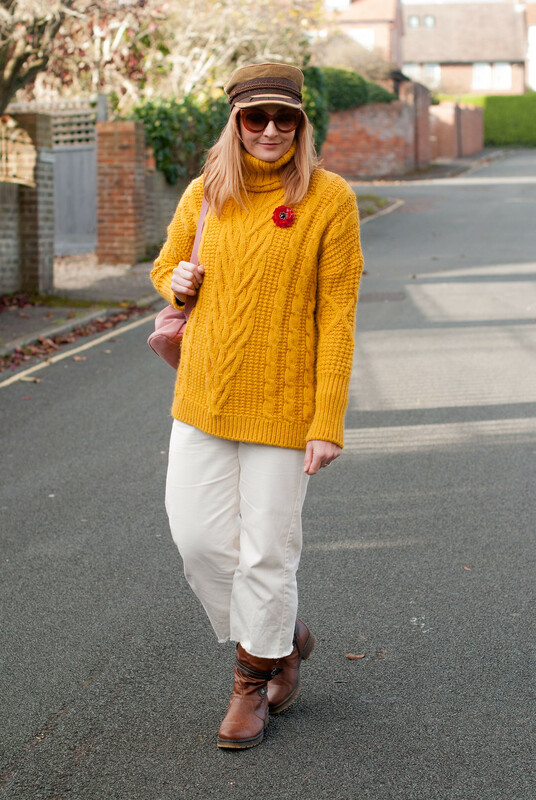 Not only that but the day I first wore it we went for a long walk along the seafront and then on for a pub lunch with friends: I was told I looked like a particular Muppet and do you know what, she was absolutely right! YOU CAN SEE THAT I SHOWED NO MONETARY SELF-CONTROL WHATSOEVER WHEN I ORDERED BOTH COLOURWAYS OF THIS FABULOUSLY-WARM SWEATER FROM WHICH TO CHOOSE JUST ONE. I’m loving this (unusual for winter) colour combination of yellow, pink, white and tan – not a drop of black in sight as I said! 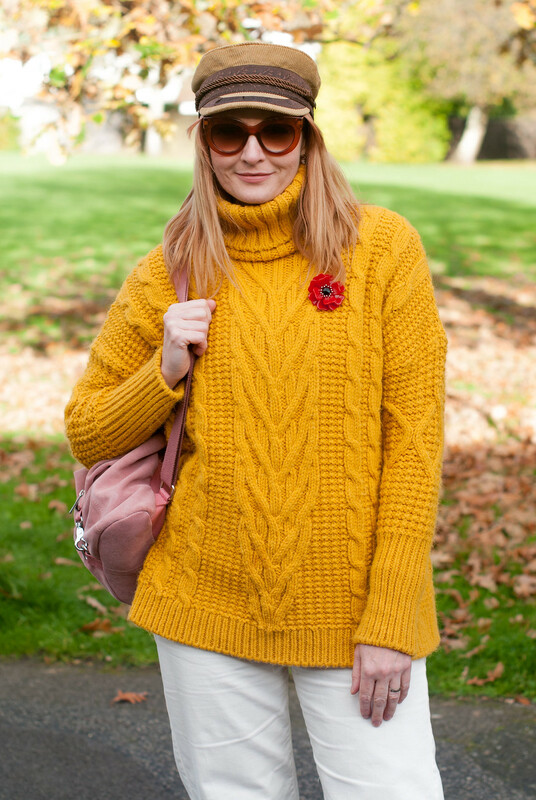 You may have seen that I wore the orangey-red version of this mustard yellow sweater a couple of weeks ago, so you can see that I showed no monetary self-control WHATSOEVER when I ordered both colourways of this fabulously-warm sweater from which to choose just one. 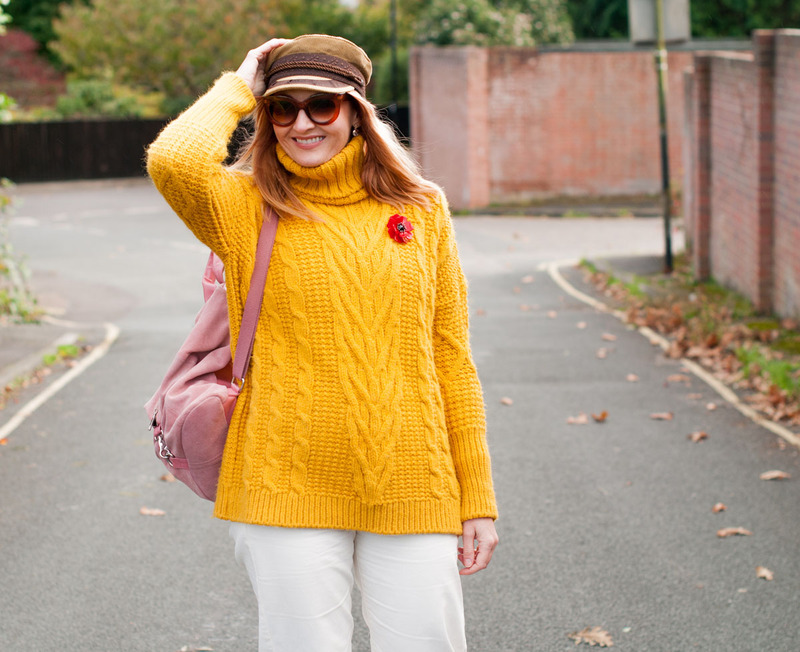 Although the weather was chilly that day it wasn’t as cold as it has been in the UK these past few days (-0.7C this morning, eek), so I was fine without a coat as well. In fact, I would have sweltered because the sun warmed me up beautifully: it was such a glorious day down on the south coast! 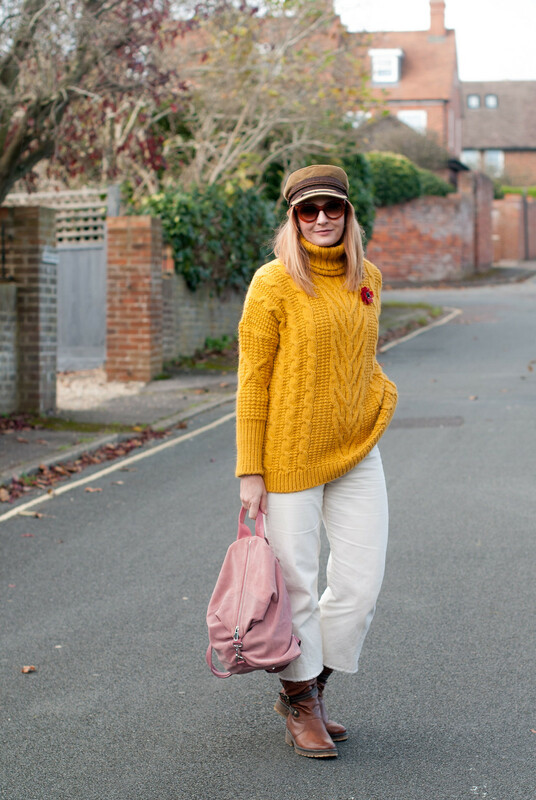 I’m actually wearing quite a few new pieces I’ve treated myself to lately in this outfit – only the dungarees (yes I’m wearing dungarees under all that knitwear) and bag aren’t new. 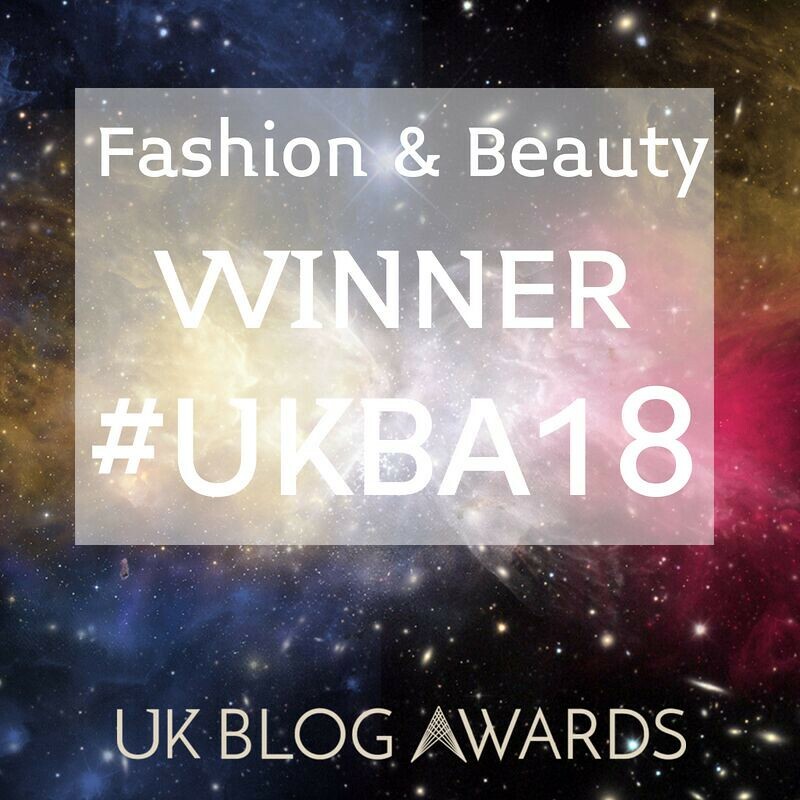 Luckily the pink suede backpack has been restocked on the Asos website, and those delicious oversized sunglasses and the Remembrance poppy are still currently available. 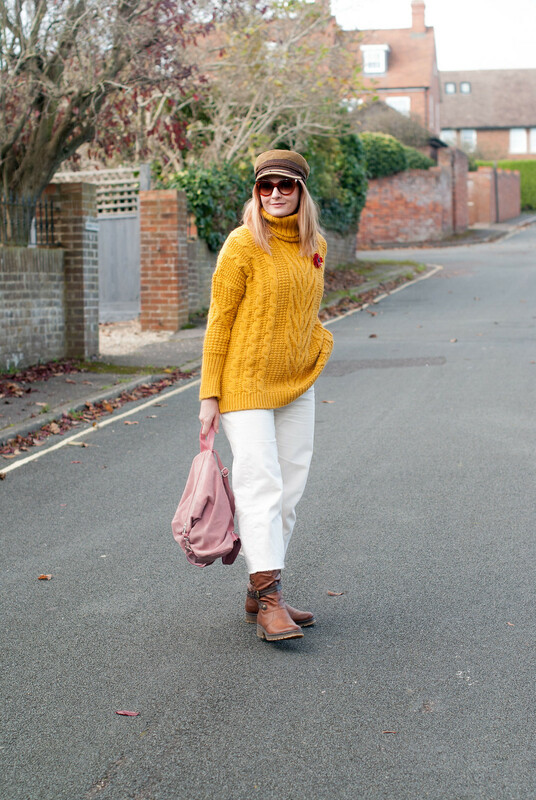 The tan calf boots are the ones I said I’d be wearing all winter – I wasn’t wrong…! ARE YOU INTO THE BAKER BOY HAT TREND (OR DO YOU LOOK LIKE A PARTICULAR MUPPET)? COMMENT BELOW, OR TAKE IT TO TWITTER @NOTLAMB! Gawdzooks I LOVE that chunky monkey jumper! It's the perfect colour for me too….. send it up to Scotland when you're fed up with it (Like that's EVER going to happen, it's a keeper. 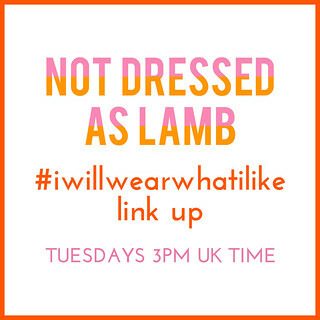 Thank you so much for linking up to #fakeituntilyoumakeit! haha, I've never seen that muppet before, but yes, I would agree on the resemblance. I really like the Baker Boy Hat Trend, but even though I don't believe in age-appropriate dressing, I'm nervous about wearing one. I did try one on in the store and I liked the way it looked so I'm thinking about it. I'm the type thats always a little slower to embrace new trends. Janice was definitely the coolest Muppet, but I always loved Miss Piggy. My inner diva appreciates her antics. And considering all the furry/feathery shoes out there, maybe her look is in fashion too! I like this baker boy hat on you! It is so flattering and stylish. You look gorgeous. Thank you for the link up. I absolutely love the roping on the hat—reminds me of my dad's greek fisherman's cap I wear!!! Gorgeous sunnies, too! And the muppets are dope! Goodness! I am seeing the baker hat everywhere… You are definitely a hat person. I am not…I don't think I'll do it. One hat I do feel really great in no matter what is a beret. Now, that one you'll see me in. I do think I'll try one on just to see. But you know how some people are just hat people? I wish I was, but I'm not. Again, except for a beret!! 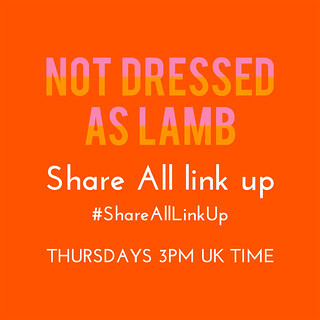 Ok, off to link up!! It's been a while. PS Unfortunately the other totally beautiful item I can't pull off, but you do marvellously is yellow. So unfortunate. But it makes me look sick! I wish I could wear both of these items with as much panache as you!! All I can say is "Oh, to have a #hatface!" I love these, in fact most hats, but really struggle to come to terms with how I look. You seem to be able to wear all kinds of hats and not look in the least bit silly (or like a Muppet). I love the sweater btw in both colourways and am sorely tempted, but my trip to London has left me strapped for cash. Thanks for the link up! I love this hat on you! And who said you look like the adorable muppet, Janice?? Well, I do see some resemblance. 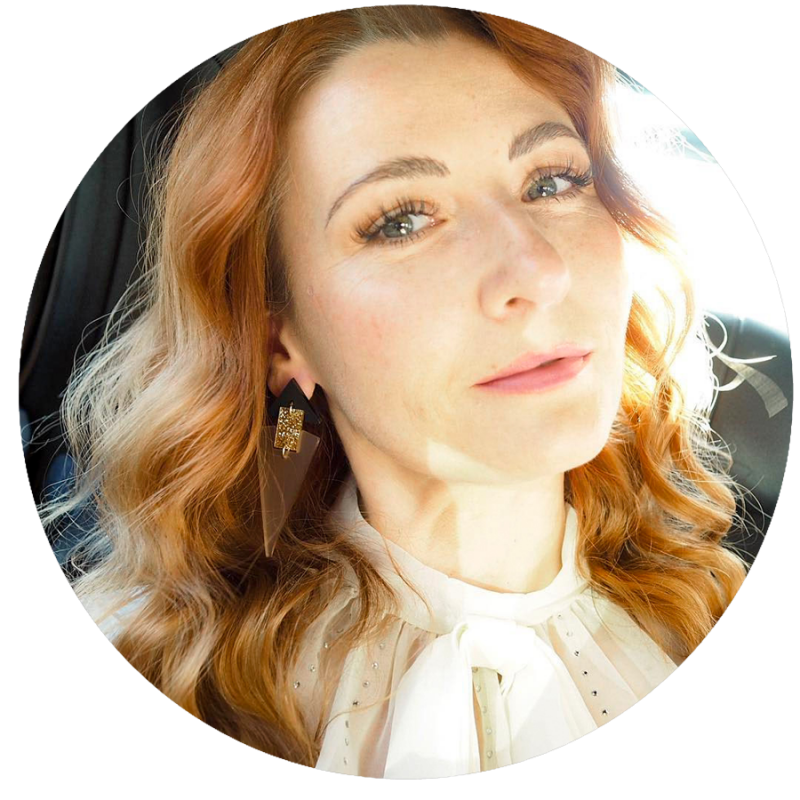 🙂 Thank you for hosting this link up! It's always a pleasure to join up. Hahaha re. muppet quip. I like your friends – I would hope my friends would do the same (and they do!) because I always need more lighthearted laughs. 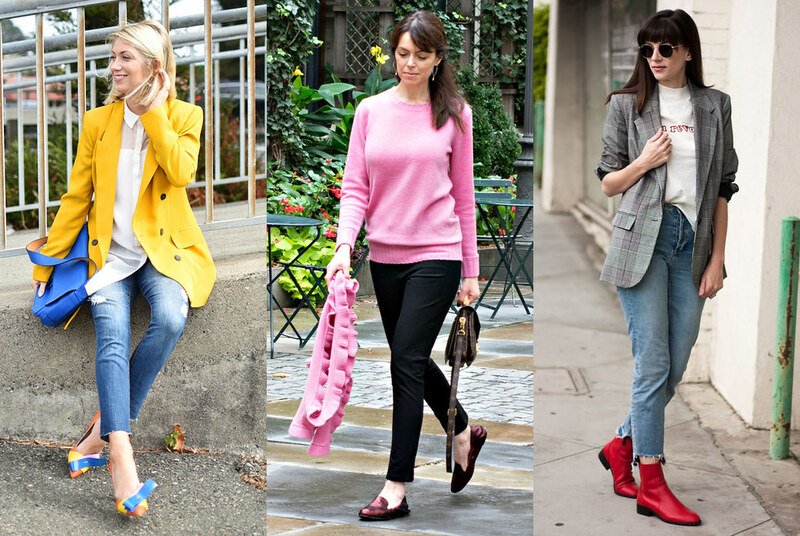 I love the mustard pullover, especially with the pink. Thanks for the linkup. 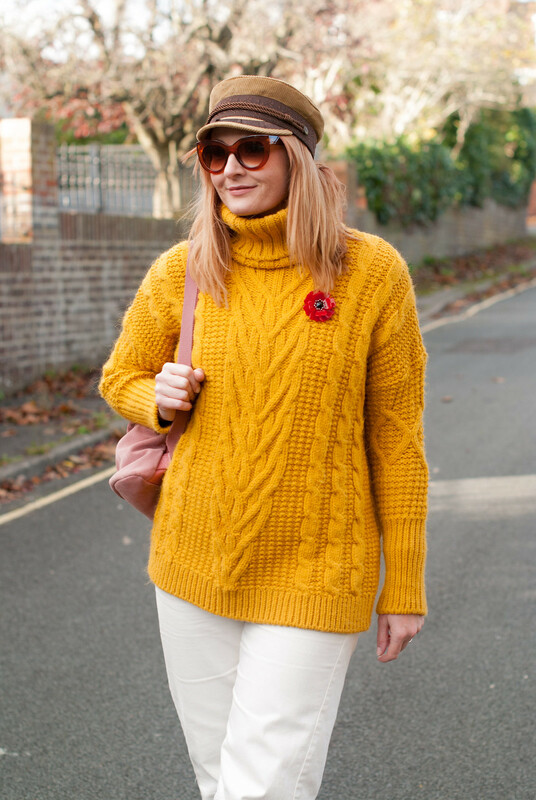 I think you look fantastic and so glad you bought the mustard jumper. Hey we're both doing the baker boy caps today! You look totally adorable, Catherine! Ha, ha, at least it wasn't Beaker! Great Baker Boy hat AND in the very on trend fabric of corduroy. Looks fabulous with the boots too. I must try to find one that fits my small head. They often drop down to my nose, hence my preference for berets! Janice is a super cute Muppet, but you are way cuter! I love this outfit and the hat is darling! I finally succumbed and bought my first beret which I am wearing today in the wet, wet snow that we are having. I have not found a baker boy hat that fits my giant head properly yet. But I will keep at it! No idea which Muppet you mean! But I love the sweater. There is something cozy about cable knit sweaters! 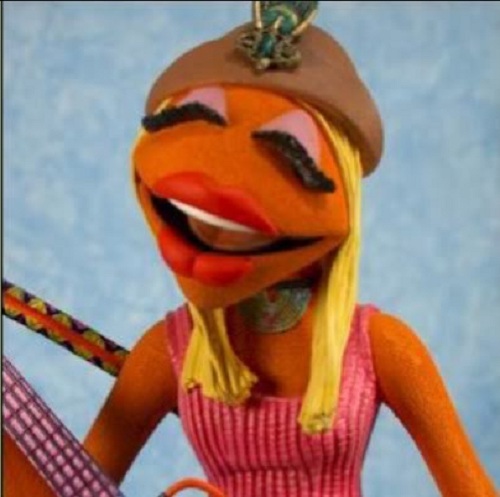 I might have to disagree—I see no Muppet resemblance…but it's a totally fun look, Catherine!! I just got one of these hats too, and I think they are a perfect accessory! hehe you have to admit I do look a BIT like Janice, Jodie…?! !